Congrats, Amanda and Abe, on launch of your new venture. From my quick walk-through, the Volcanic Bottle Shoppe has a great selection of bottled beers you won’t find at other Hood River retailers, plus four taps featuring a rotating lineup of compelling Oregon craft brews. A nice addition to our choice selection of home-grown craft brewers. 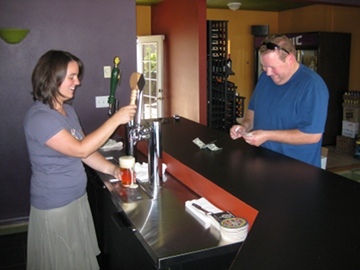 Preparing for the Feb. 24 grand opening celebration, proprietor Amanda Goeke pulls a draft for an early customer.